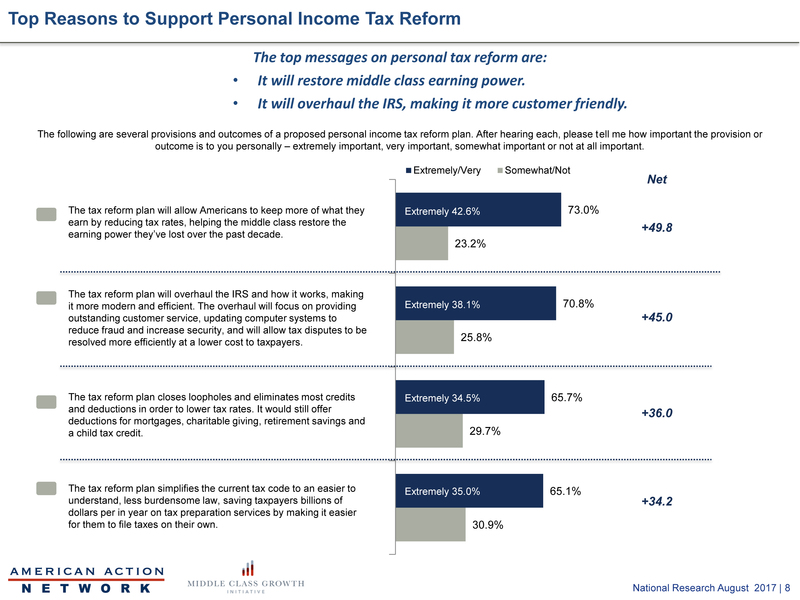 The American Action Network (AAN), a group aligned with Paul Ryan and the House Republicans, put out a poll that purports to show how much the American people want to cut taxes on the wealthy and corporations. 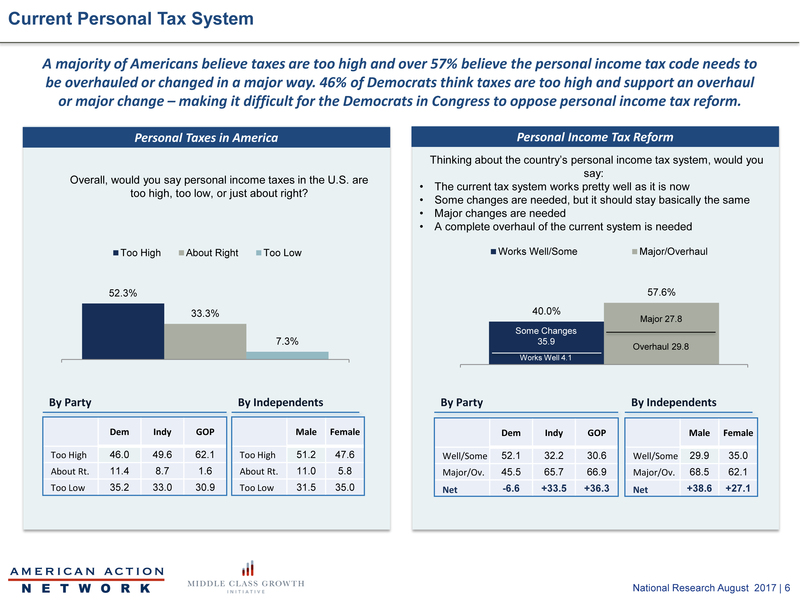 The pollster does not show the entire questionnaire, but from the presentation, AAN uses deceptively framed questions to make people believe Americans overwhelmingly support them. My only question is if AAN knows this is pile of manure and are trying to pass it off as haute cuisine, or if they actually believe their own nonsense. Plenty of publicly available research undermine their findings. Depending on when they ask the question in the chart above, it poisons the rest of the survey. Supporters of Pelosi wouldn’t describe her agenda as fighting against “any” tax cuts and “loosened” regulations on businesses. Ryan does not want to “fix” Obamacare, he wants to end it and has said so many times, not to mention voting to end it dozens of times. 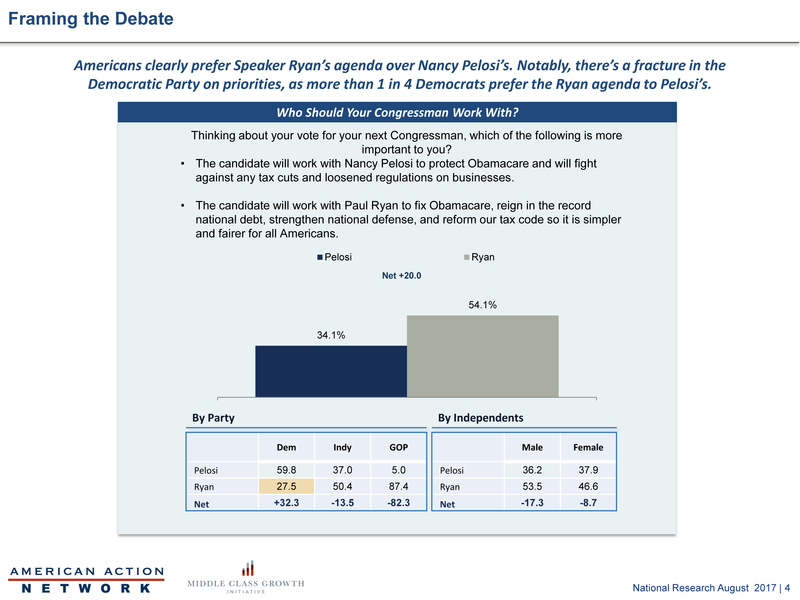 They might as well as ask “who do you prefer: A candidate who will kill puppies with Nancy Pelosi and bathe in their blood or a candidate who loves puppies like Paul Ryan?” Back on planet earth, Ryan’s unpopularity (29% favorable, 52% unfavorable) matches Pelosi’s (27% favorable, 53% unfavorable). This chart shows that Americans want Republicans and Democrats to work together. Not a shocking finding. However, even this chart shows that adding Donald Trump to the equation reduces the desire for kumbaya by 20+ points. 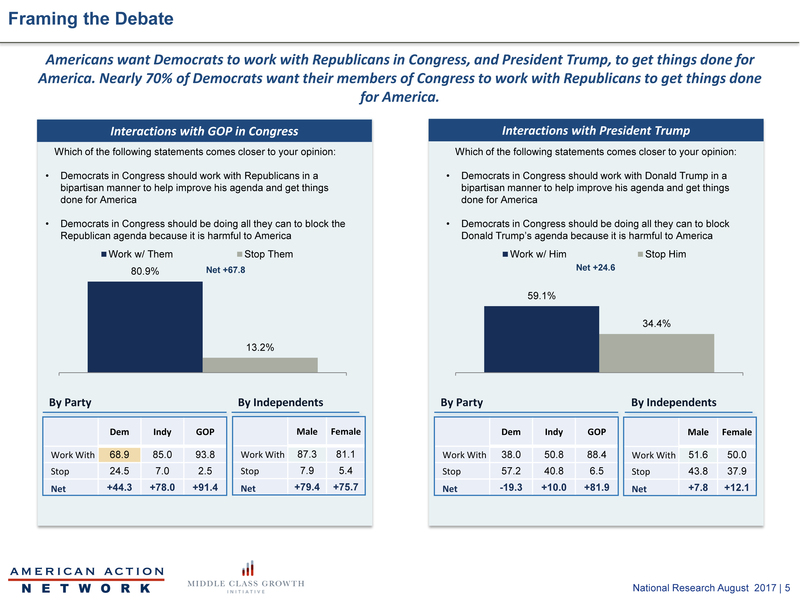 Odd framing in the first chart when they ask “Democrats should work with Republicans in a bipartisan manner to improve his agenda.” It’s telling that AAN associates a masculine term with Republicans. The party does have female members. I thought they value them, but I guess not. Sad! This question is meaningless because they don’t define “the agenda.” There are legitimate differences between the parties on the economy, taxes, health care, Social Security, Medicare, and the role of government in American life. Not defining the parameters of the debate renders this conclusion meaningless. This question is written to push Democrats to accept the GOP agenda and not work together. Republican voters don’t want to compromise on their priorities — 59% prefer elected officials who stick to their positions while only 38% want their leaders to compromise. 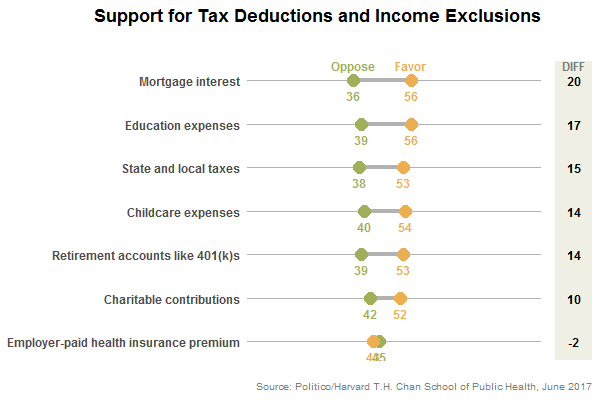 Americans think taxes are too high and the tax code needs changes. Also, the sky is blue and water is wet. So what? Do Americans think their taxes are too high? According to Gallup, 51% say they are too high and 42% say they are about right. A narrower gap than the one in the chart above and far closer than in earlier decades. 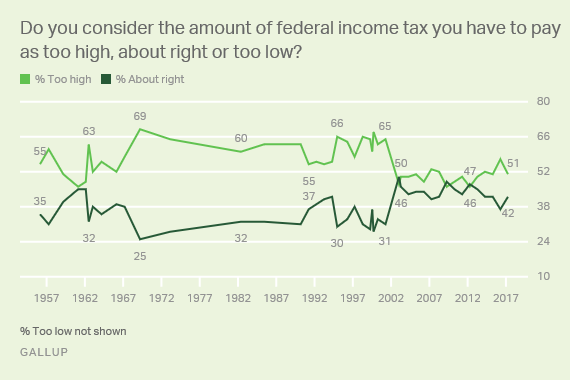 In April of 2001, shortly before President George W. Bush and the Republican Congress dramatically cut taxes, 65% said they were too high versus 31% about right. 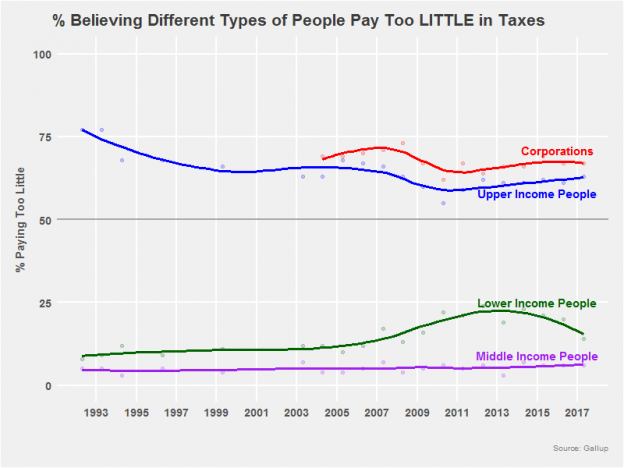 The share of voters saying their taxes are too high today is far lower than in recent decades. In addition, 61% say the amount they paid in taxes for 2016 was fair compared to just 35% who say it is unfair. There is a lot to unpack in this chart. Essentially, “the tax code is too complex, has too many deductions, thus it should be made flatter and fairer and if it passed, it would help me and my family.” Yes, the tax code is complex. No one disputes that. However, they make many assumptions in the questions that are not backed up by independent research. 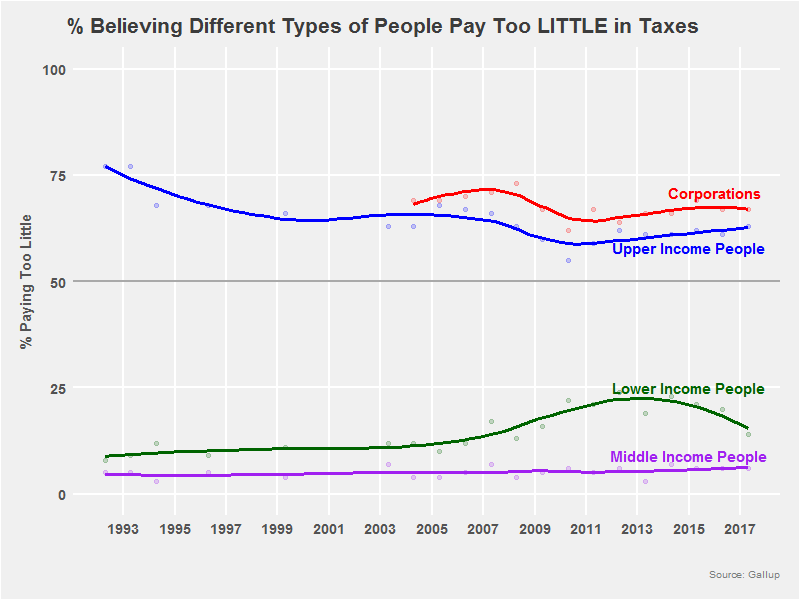 Americans do not believe wealthy people and corporations pay too little in taxes. They want them to pay more. In a study done in 2014 by David Broockman and Douglas Ahler, voters were given seven choices of tax policy to choose from — 3 liberal positions, 3 conservative positions, and one in the middle to keep the status quo. 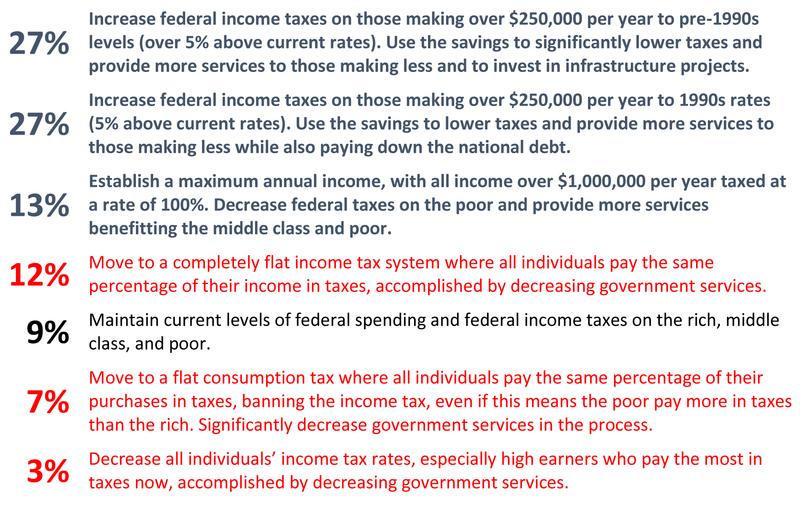 Two-thirds support raising taxes on those making more than $250K/year or capping income at $1 million a year and expanding government services to middle and low-income people. Cutting taxes and reducing government services might be the dominant position in the Congress (whether or not members have the guts to say it out loud), but not among the people they purport to represent. In the next part of the poll, voters hear four arguments slanted to the GOP and no counter messages. 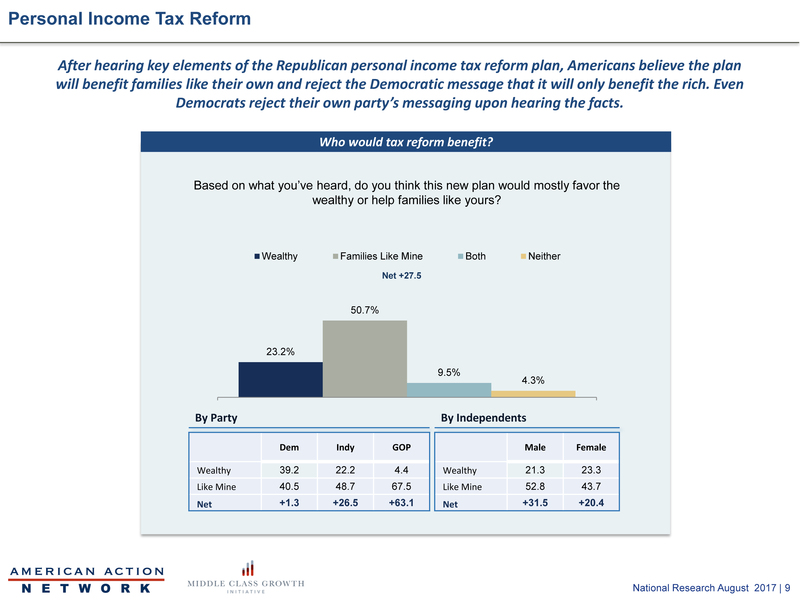 Unsurprisingly, after hearing the propaganda, people think that the GOP “reform” will benefit families like them instead of the wealthy. Voters don’t like this proposal— 62% oppose it while just 24% favor. Republicans split (40% favor-41% oppose) with Democrats (9% favor-85% oppose) and Independents (27% favor-60% oppose) largely in opposition. 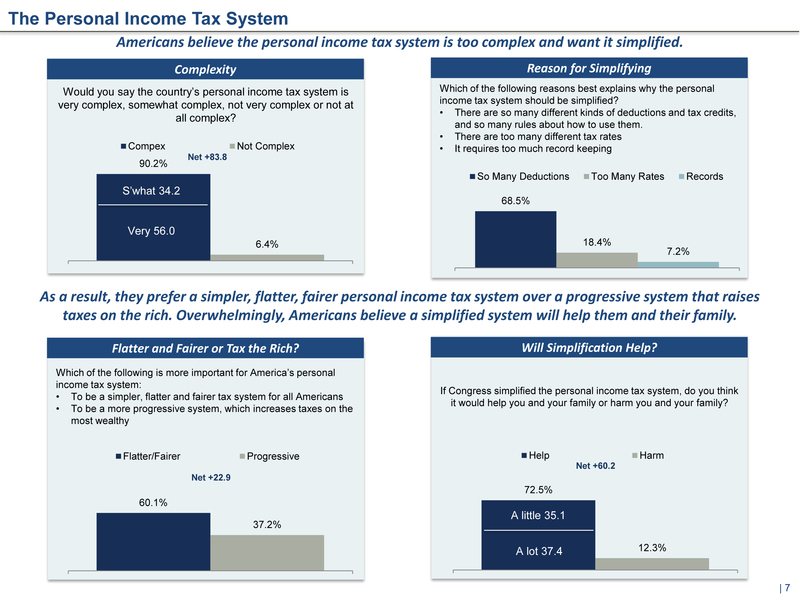 When the debate moves away from the “complexity” of tax forms to who benefits and who does not, Republicans lose badly. 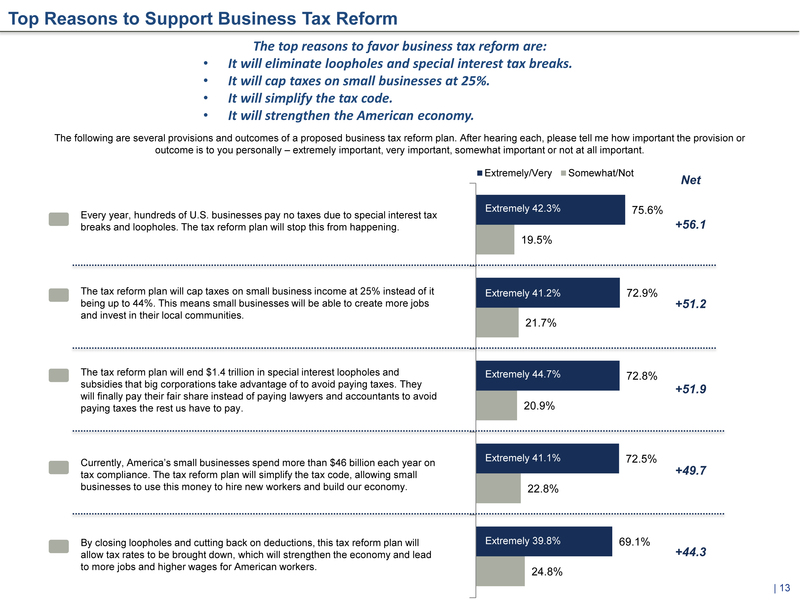 Voters don’t believe this tax plan will improve the economy or create jobs (57% not improve, 34% improve) and believe it will either hurt (33%) or make no difference (42%) to them. Only 20% think it will help them. 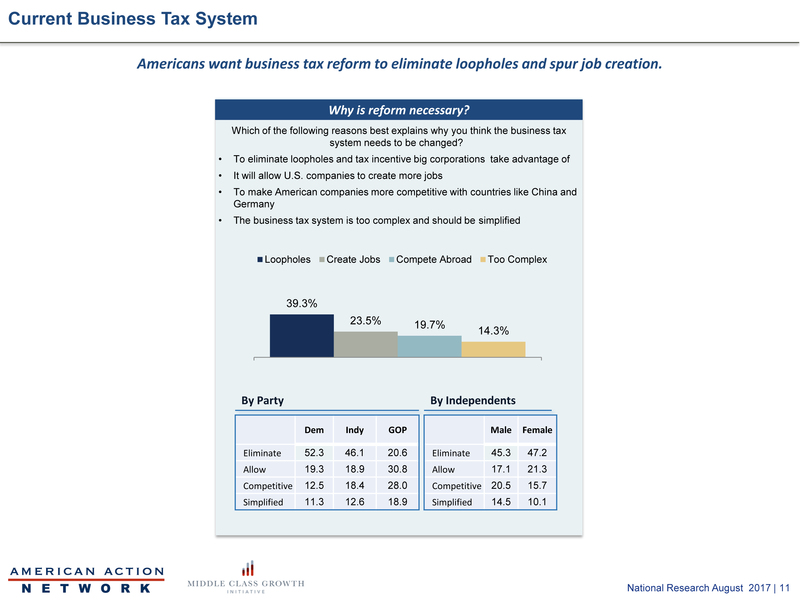 Moving to business taxes, the American Action Network uses a lot of rhetoric and oddly worded questions to make it seem like Americans support cutting taxes on corporations. 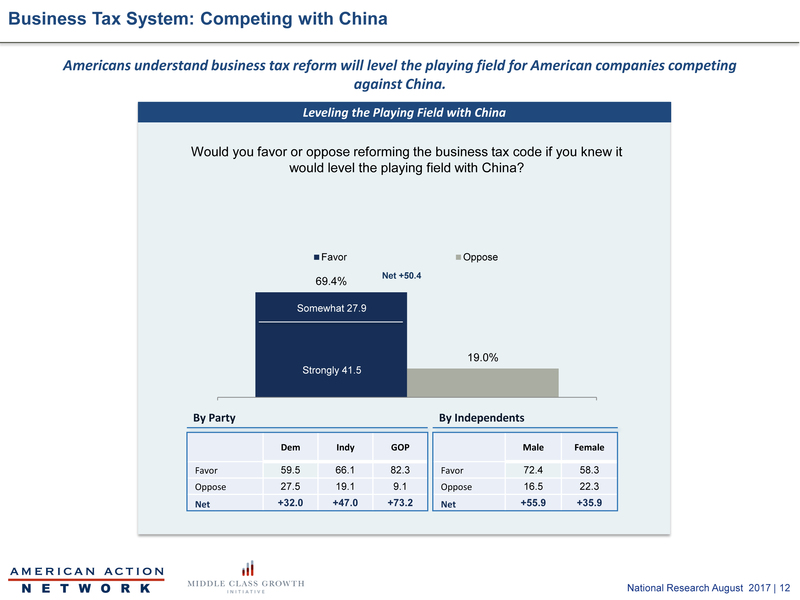 To summarize their points: Americans believe that the “business” tax system “needs changes,” is relevant to people’s lives, corporations take advantage of too many loopholes, “reform” will “level the playing field” with China, and they respond to a battery of one-sided questions with no corresponding messages from the other side. AAN’s nose grows in their use of the work “business tax.” There is no such thing. It is the “corporate tax.” That’s how it is described in the tax code. Businesses fill out “Form 1120, U.S. Corporation Income Tax Return.” They are described as a C corporation, an S corporation, a Limited Liability Corporation (LLC). 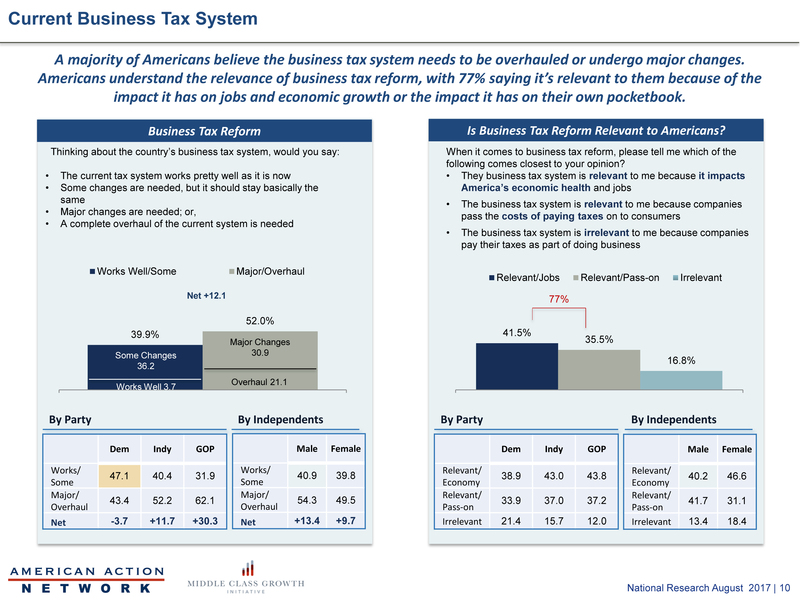 There is no “business tax” that is separate from the “corporate tax.” They use “business” in the poll because people respond more positively to that word. When AAN uses the word “corporation,” it’s to tilt a question to their desired response — that people believe “corporations,” as opposed to “businesses,” use too many deductions. In no reality do Americans want corporations to pay less in taxes which they would if the GOP got their way. How do we know corporations will pay less? They would be howling if the deductions corporations lose were not offset by lowering the corporate tax rate. Some corporations have balked at proposals floated. Retailers mobilized to kill Paul Ryan’s idea to tax imports and the GOP Congress caved. This will keep happening until the GOP reaches a final version that cuts corporate tax revenue for everyone and increases the deficit. When the GOP does that, Americans will oppose it. 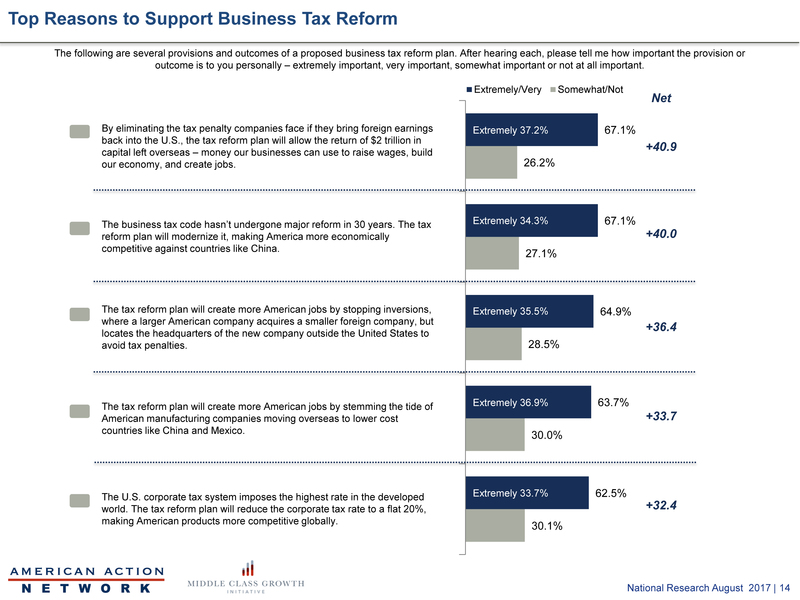 Americans already favor increasing taxes on wealthy Americans and large corporations in order to help reduce income inequality in the U.S. (63% favor-31% oppose). They think corporations are not paying their fair share of taxes (9% too much, 19% fair share, 65% too little). Unless the GOP can come up with a plan that takes away deductions from corporations and makes them pay more while also reducing the deficit (something they tried to do in 2014 and failed), they will be on the wrong side of public opinion. They know this or this poll wouldn’t use such convoluted language. They would let their beliefs compete honestly with those on the other side. This entry was posted in Uncategorized on August 10, 2017 by sjclermont. Tom Perriello won the central part of the state, the area he represented in Congress from 2009 to 2011. He lost pretty much everywhere else – northern Virginia, Richmond, and Hampton Roads. There was a lot of talk about how this election was a Hillary-Bernie rerun but that was really a bunch of nonsense. Only about 16% of the variation in Perriello’s vote share by city/county can be explained by Bernie’s share of the vote in 2016. Some correlation exists but not much. Party Share of the Primary Vote. 176,374 more people chose a Democratic primary ballot than a Republican one. Democrats represented 59.7% of voters. The Democratic advantage came in Northern Virginia (Arlington, Alexandria, Falls Church, Fairfax, Loudoun, and Prince William), Richmond, and Hampton Roads, the vote rich centers of the state. They also got more votes in Roanoke, Charlottesville, and a few scattered counties and cities in the central and western part of the state. More Republicans voted in the west, particularly the counties bordering West Virginia and Kentucky and the counties separating greater DC and Richmond. If Republicans can’t improve their performance in the northern, Richmond, and Hampton Roads area, Millionaire Lobbyist Ed Gillespie has no chance of winning. 223,454 more people voted in the Democratic gubernatorial primary in 2017 than in 2009, a 70% increase. Turnout increased 162.2% in Loudoun and 151.7% in Prince William County, the two fastest growing counties in northern Virginia. Turnout fell only in the western counties bordering West Virginia and Kentucky. Ralph Northam will do poorly there in November, but it won’t matter as long as he holds the growing regions of the state that have consistently voted Democratic since 2009. This entry was posted in Uncategorized on June 15, 2017 by sjclermont. UK Prime Minister Theresa May called for a snap election for a “stronger Brexit mandate.” Why she needed this, who knows. She had a wide advantage in the Parliament, the public voted to Leave the EU, and she was picked by her party to lead the Parliament. Polls showed a wide lead when the campaign began, but now, based on the polls, the composition of the Parliament would barely change. 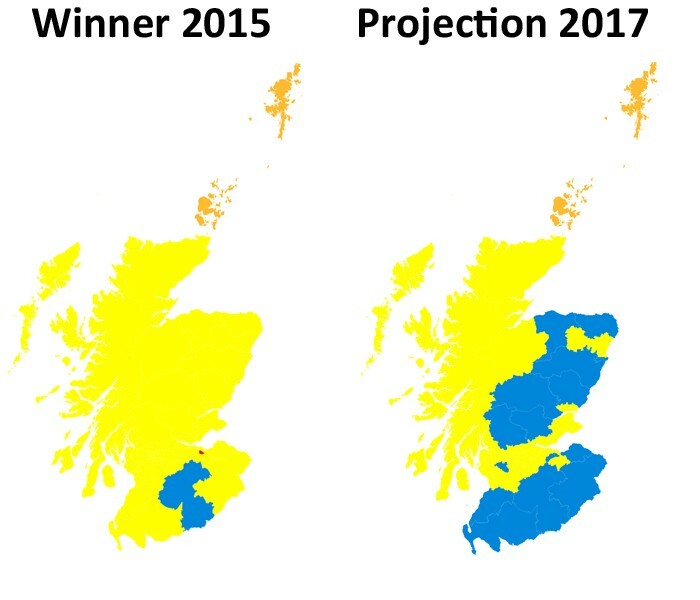 For Labour to win the election, they would need to 1) recover in Scotland where they went from 41 to 1 seat in 2015, 2) have the Liberal Democrats take back seats from the Tories that they lost in 2015 in constituencies where Labour does not compete, and 3) have UKIP hold down the Tory vote total so Labour could win narrowly in more conservative districts. None of these things are likely to happen so Labour needs to hold on to what they have. They are doing this. While the Tories would win the election easily, much like they did two years ago, this doesn’t give them any more of a “mandate.” If anything, it makes them weaker heading into the talks with the EU. 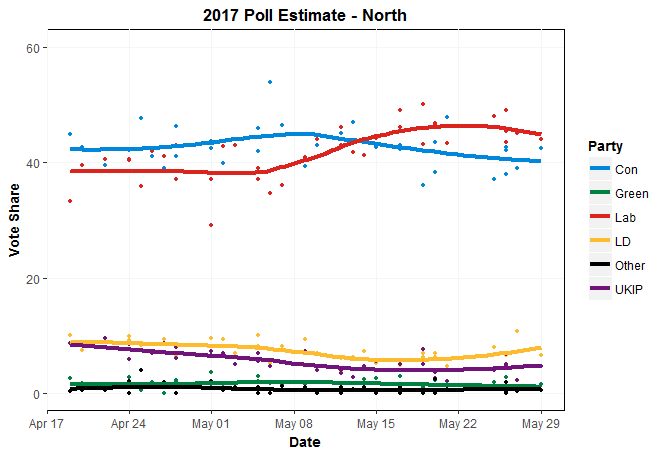 For the nations of Scotland and Wales, we chose large sample polls of those countries and did not mix in the small subsamples from UK wide polls. You can get links to all of the polls here. 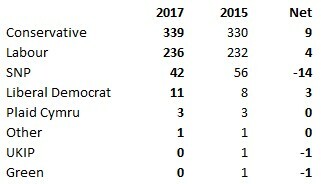 In 2015, Labour won the plurality of votes in the 2015 election and took 110 seats to 44 for Conservatives and 4 for the Liberal Democrats. The Conservatives have gained 9.7 points in the polls but Labour has also increased. All of this comes at the expense of UKIP. At the beginning of the campaign, the Tories led in this region but Labour has overtaken them. Southport is most likely to switch from Liberal Democrat to Conservative. Besides the North, London provides a significant share of Labour’s MPs. They won a plurality in 2015 and have increased support in the polls along with the Liberal Democrats. The Tories and UKIP have ticked down. 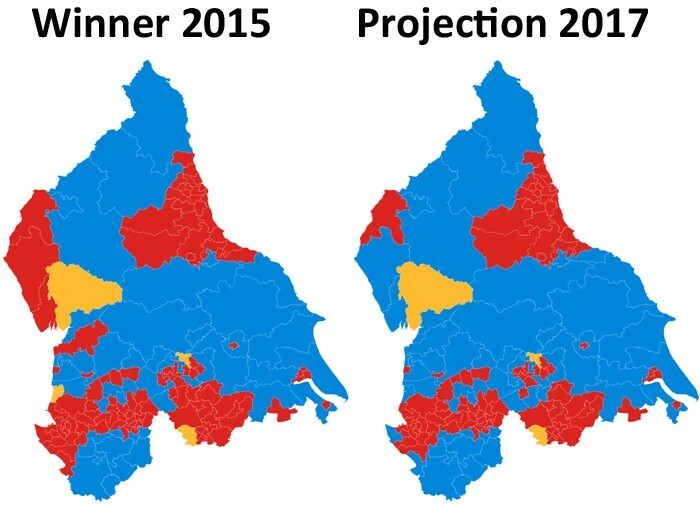 The Tories began the campaign in the lead here, but like in the North, they have given in back to Labour. This is the heart of Tory UK. They dominated in 2015: 130 seats to 8 for Labour (Buckingham is officially nonpartisan). The Conservatives have even increased their support in the polls. However, Labour has gained even more. The UKIP vote here is going more to Labour than the Conservatives. 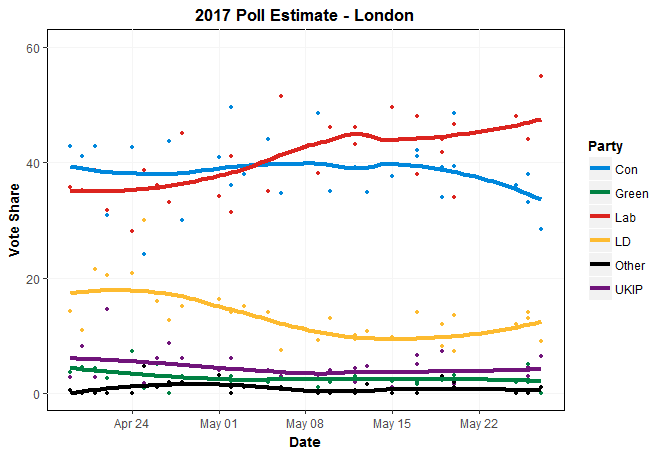 The Tories have pretty much flatlined in support while Labour has steadily increased, particularly the last three weeks. As of today, we project 115 (-15) seats for the Conservatives and 24 for Labour (+16). This region is the most perilous for Theresa May and if the result mirrors the polls, it will be the biggest reason for all the egg on her face. This also represents the heart of the Tory majority. The Tories will win big here and take a large bulk of the seats. However, it won’t net them many more seats as the UKIP collapse benefits both the Tories and Labour by roughly the same amount. 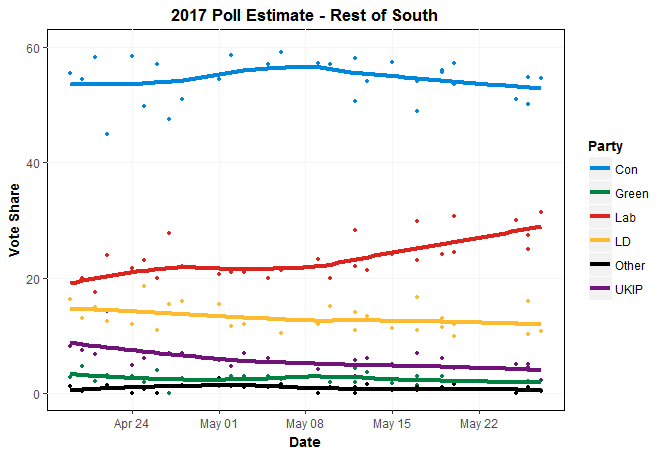 As in the South, the Tories are at where they started while Labour has steadily increased. As of today, we project 116 (-2) seats for the Conservatives, 46 (+3) for Labour, and 1 (0) for the Liberal Democrats. No change for the Tories will mean no additional “leverage” for negotiations. She needs to wipe out Labour here and she isn’t doing it. 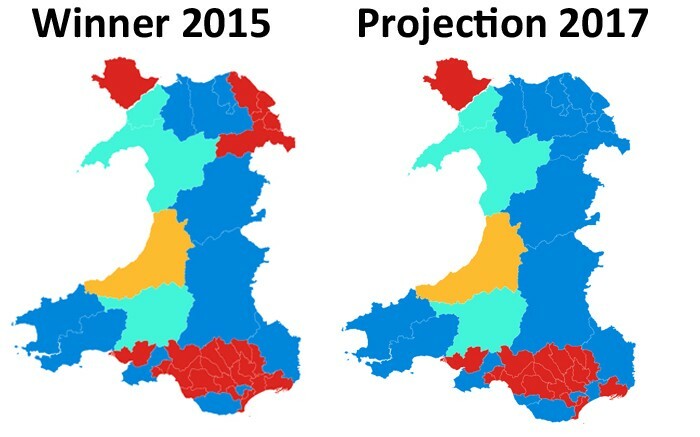 The Tories have gained the most here while Labour, the Liberal Democrats, and Plaid Cymru have either held steady or slightly declined. UKIP has fallen significantly. As of today, we project 19 (-6) seats for Labour, 17 (+6) for the Tories, 3 for Plaid Cymru (0), and 1 (0) for the Liberal Democrats. 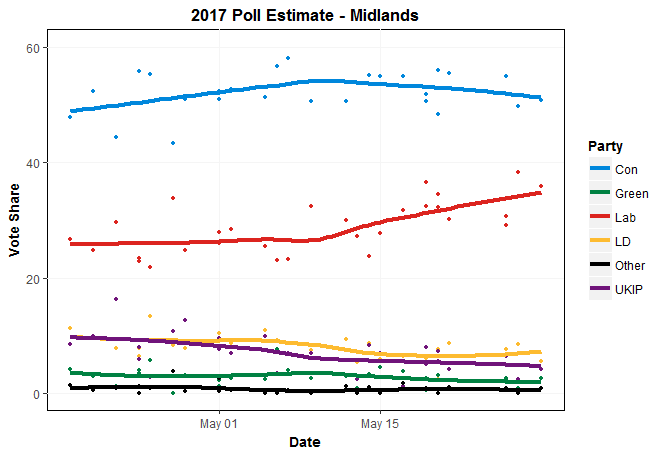 Theresa May has the potential for gains here but later polls will tell if it is real or if the Labour surge in England happens here too and stays with a similar party breakdown as in 2015. 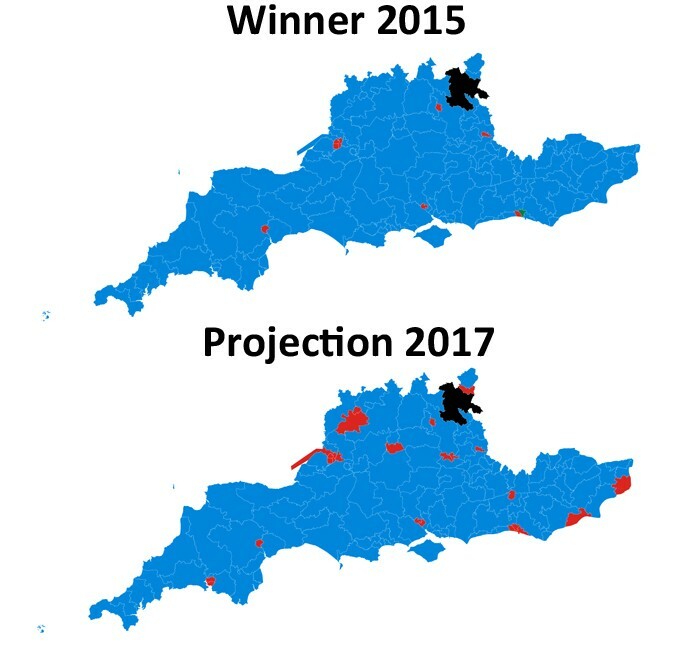 This is the only region of the country where Labour trails where they were in 2015 but it doesn’t really matter because they can lose 1 seat at the most. The Tories have surged at the expense of everyone else except UKIP because UKIP has no support base in Scotland. As of today, we project 42 (-14) seats for the SNP, 16 (+15) for the Tories, and 1 (0) for the Liberal Democrats. The Tories have gotten the better of the Independence debate here so far, as well as attacking the SNP’s performance in Holyrood and Westminster, factors they can’t benefit from in England and Wales. Theresa May called this election expecting an easy win. Her personal advantage over Jeremy Corbyn, the belief that Brexit negotiations would subsume all issues and she wouldn’t have to answer on the future of the NHS, social care funding, and relations with Donald Trump. She could just say “strong and stable” and talk about how horrible Jeremy Corbyn is. It hasn’t worked. The Tories will win the election but essentially a rerun of the 2015 results is as bad for her as the Leave vote was to her predecessor. Both campaigns were headed by Linton Crosby and Jim Messina so it shouldn’t be that much of a surprise they haven’t really clued into the pulse of the UK voter since Ed Miliband departed the stage. This entry was posted in Uncategorized on June 1, 2017 by sjclermont. As more and more data gets released about the 2016 election, the decisive factor for Trump occupying the White House remains elusive (was it more Putin or more Comey?). However, we can begin to eliminate some reasons people have given. 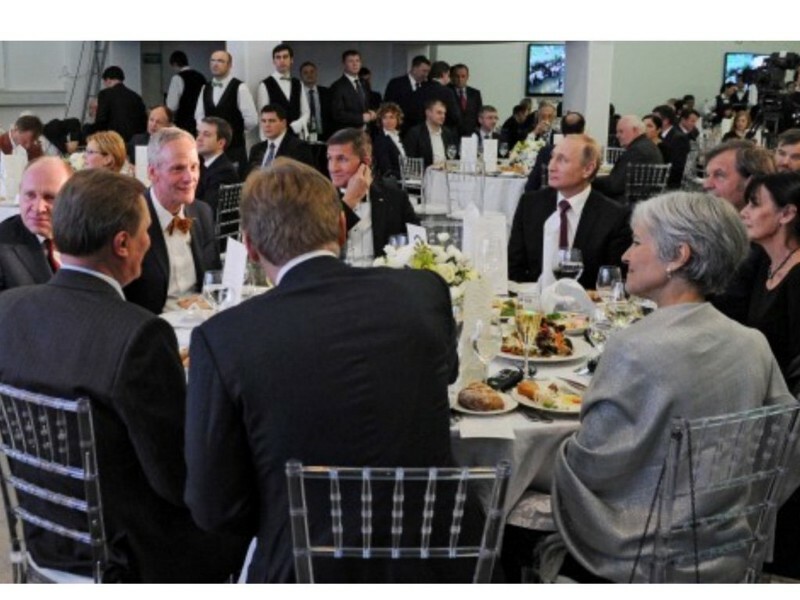 Several articles in the immediate aftermath placed the blame on Libertarian Gary Johnson and Green Jill Stein (see here, here, here, here, among many others). On the surface, it does look like they harmed Hillary Clinton. Both Johnson and Stein ran in 2012 and received 1.35% of the vote (.99% for Johnson, .36% for Stein). In 2016, they each tripled their support (3.27% for Johnson, 1.06% for Stein). Trump got a smaller share (45.94%) than Mitt Romney (47.15%), but Hillary dropped by even more (48.03% compared to 51.01% for Obama). 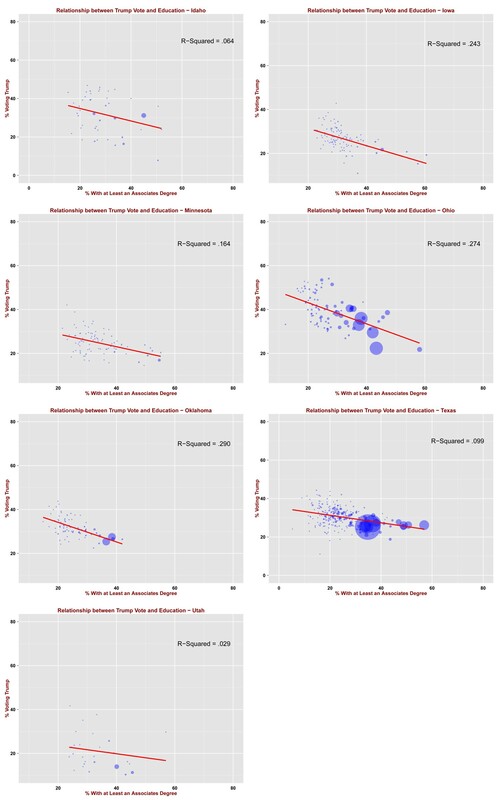 Thanks to the Cooperative Congressional Election Study (CCES), we can examine the minor party vote with more rigor. No matter how you cut it, Johnson, Stein, McMullin, and the rest did not make a difference. They ended up masking more Trump supporters than ones for Hillary. Trump gained disproportionate support in the final weeks of October. The CCES interviewed people both before and after the election. Taking those who said they are registered to vote and did surveys before and after election day (44,667 total interviews), Trump gained seven points while Hillary gained just three. Because of the wisdom of several old, rich, white slaveowners 230 years ago, that was enough for Trump to “win”. Trump kept a greater share of his voters than Hillary did her. More than triple the share of initial Hillary supporters went for Trump than vice versa (2.6% vs. 0.8%). Half of initial Johnson and Stein supporters went for someone else. 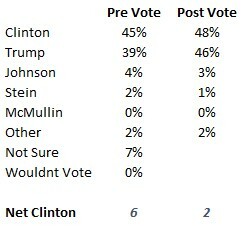 Johnson voters tilted more towards Trump while Stein voters went for Hillary. Those undecided went for Trump by a 50.0% to 34.2% margin. 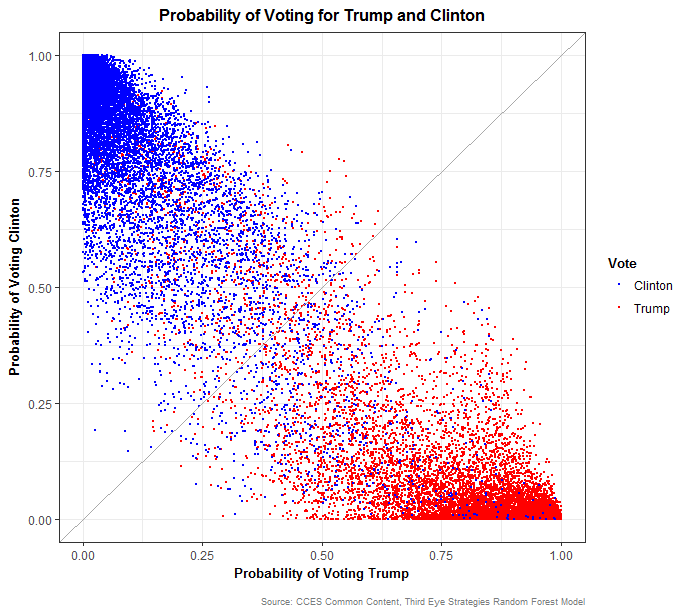 Using Random Forest regression, we developed a Trump/Clinton model based on the demographics and responses in the poll. We trained the data using a random selection of 15% of the poll respondents and applied it to the remaining 85% (click here for data and R code). 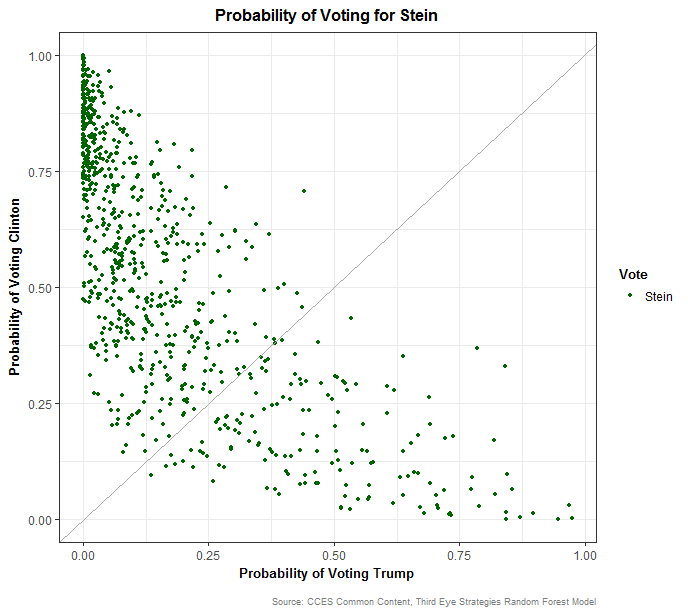 This gives us a probability of voting for Trump and Clinton for each participant. The model works well in classifying voters. Assigning the candidate with the higher probability as the predicted vote, the model gets 95.8% of Clinton’s voters and 94.2% of Trump’s voters correct (the dots above the diagonal are mostly blue and the ones below red). 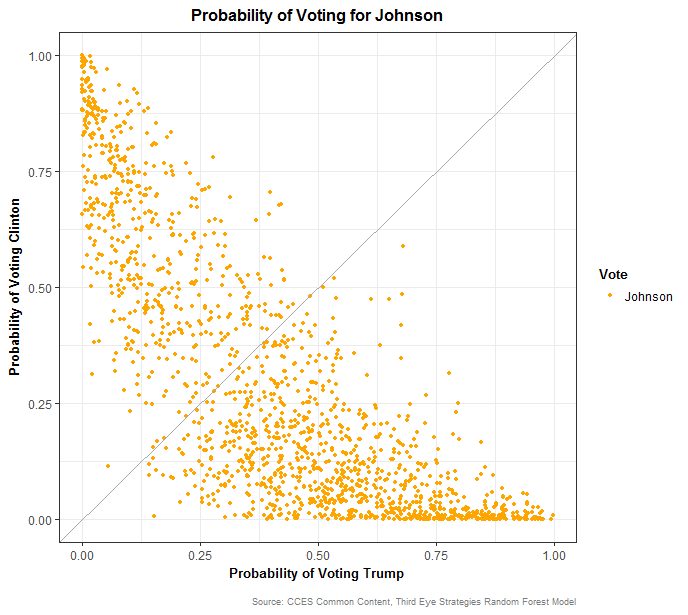 Among Johnson’s voters, 33.7% have a higher probability of voting for Clinton and 66.3% for Trump (note the higher density of observation below the diagonal line). Moreover, 12% of Bernie Sanders primary voters went for Trump, as did 11% of Obama 2012 voters and 5% of those who consider themselves ‘liberal’. 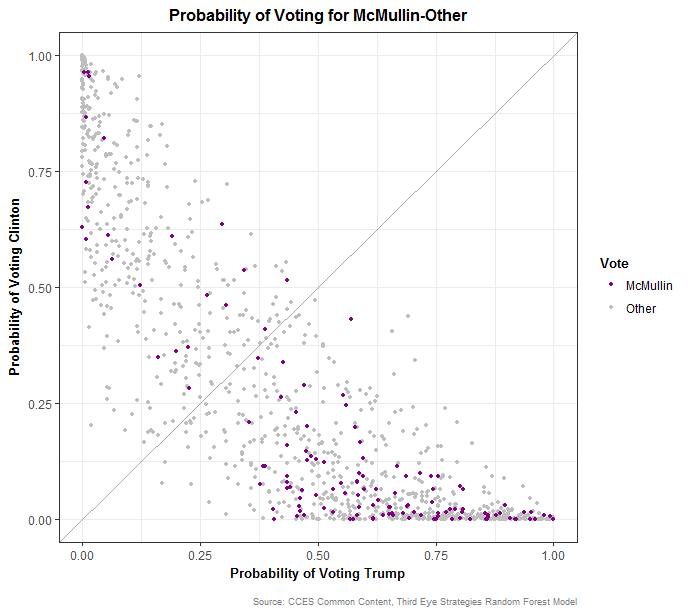 Evan McMullin (81.8% predicted Trump, 18.2% predicted Clinton) and those supporting other candidates (63.8% predicted Trump, 36.2% predicted Clinton) also tilt heavily towards Trump. Allocating the minor party vote to Hillary and Trump results in Trump expanding his margins in the key swing states of Wisconsin, Michigan, Pennsylvania, and Florida. Whatever Hillary would gain from Stein voters, she loses far more with the other candidates removed. But what if we just get rid of Stein? If we allocated just Stein voters and not anyone else, Hillary still loses. 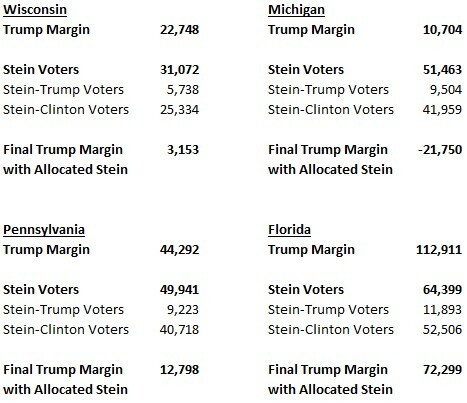 Even though Stein got more votes than what Trump won by in the decisive states of Wisconsin, Michigan, and Pennsylvania, there is no data that justifies 100% of Stein voters going to Hillary. 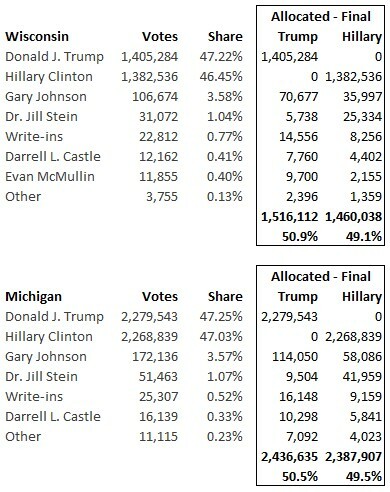 If Hillary received 81.5% of Stein voters, she only flips Michigan. Given the attitudes of voters that we can examine more deeply, we can’t justify “blaming” Gary Johnson, Jill Stein, Evan McMullin, and other people either on the ballot or written in for Trump. The Orange Idiot would have received 270+ Electoral Voters in both a two-party race and one without Jill Stein. This entry was posted in Uncategorized on March 28, 2017 by sjclermont. At the end of last week, the Senate concluded voting on President Trump’s first round of cabinet nominations. His initial Labor Secretary nominee, Andy Puzder, dropped out because he couldn’t suppress the interview of his ex-wife describing how he beat her up (Trump hires the best people). The Senate haven’t held hearings on his next nominee Alexander Acosta (another prize). The Senate held votes on 18 nominees. 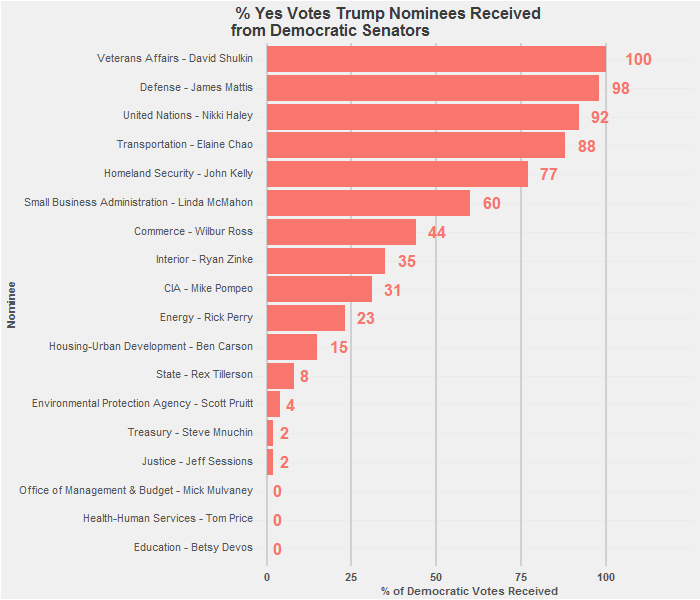 Among Republicans, Trump’s nominees received 99.5% of the Yes votes available in the chamber (a few missed votes). Democrats only voted to approve Trump’s choices 37.7% of the time. Joe Manchin from West Virginia voted for the most nominees. Kirsten Gillibrand from New York approved of the fewest. Support for nominee varied widely. Shulkin, Mattis, Haley, Chao and Kelly at Homeland Security got strong support. Devos, Price, and Mulvaney got no Democratic votes. Carson, Tillerson, Pruitt, Mnuchin, and Sessions were widely opposed. 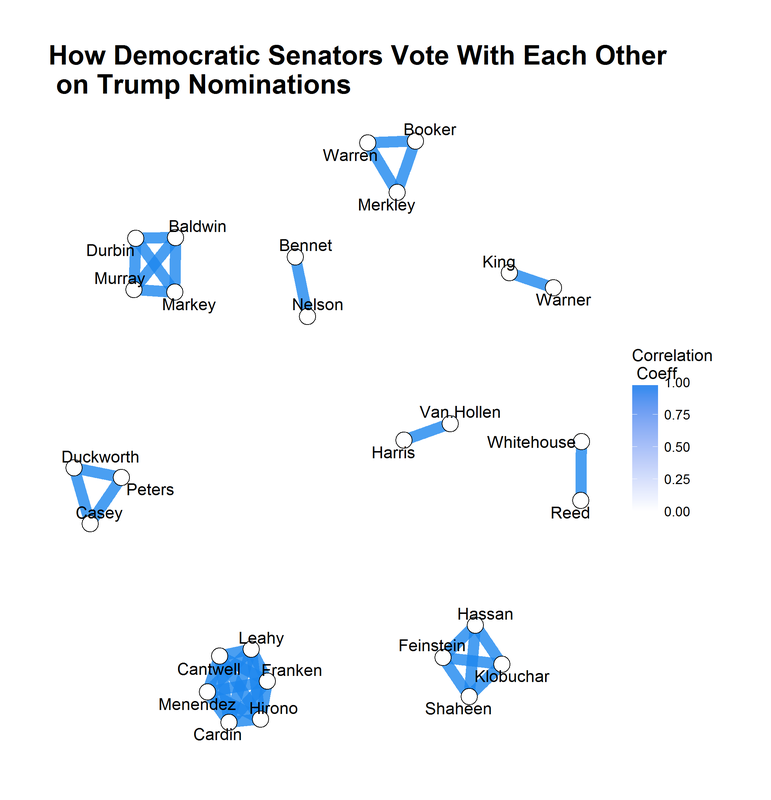 Looking beyond the percentages to see how the Democrats voted compared to each other to the correlations between senators, most voted with each other with Manchin as a clear outlier. 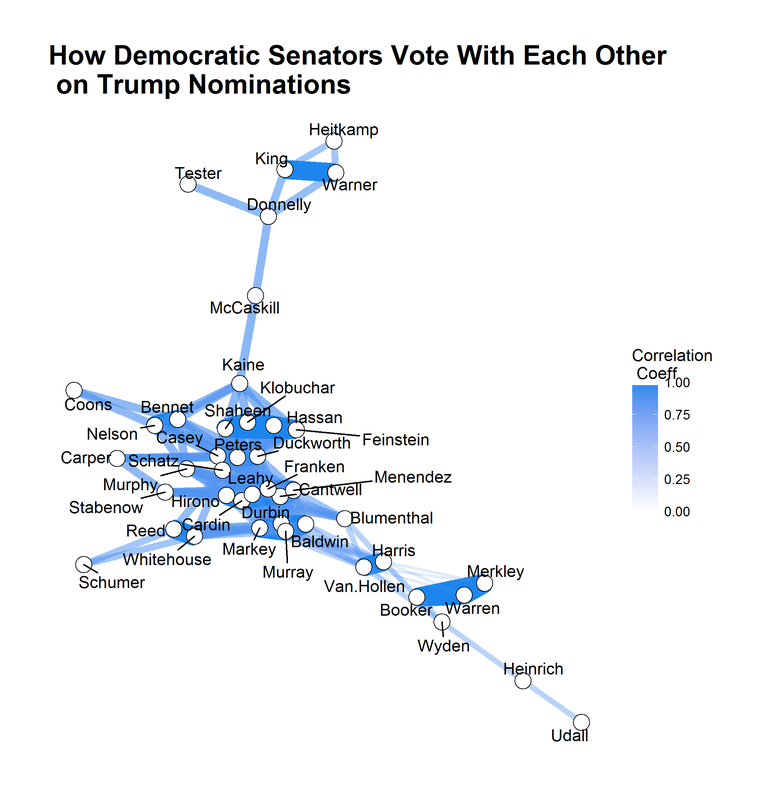 Tom Udall’s vote correlates to his fellow New Mexican Martin Heinrich, but with no other senator. 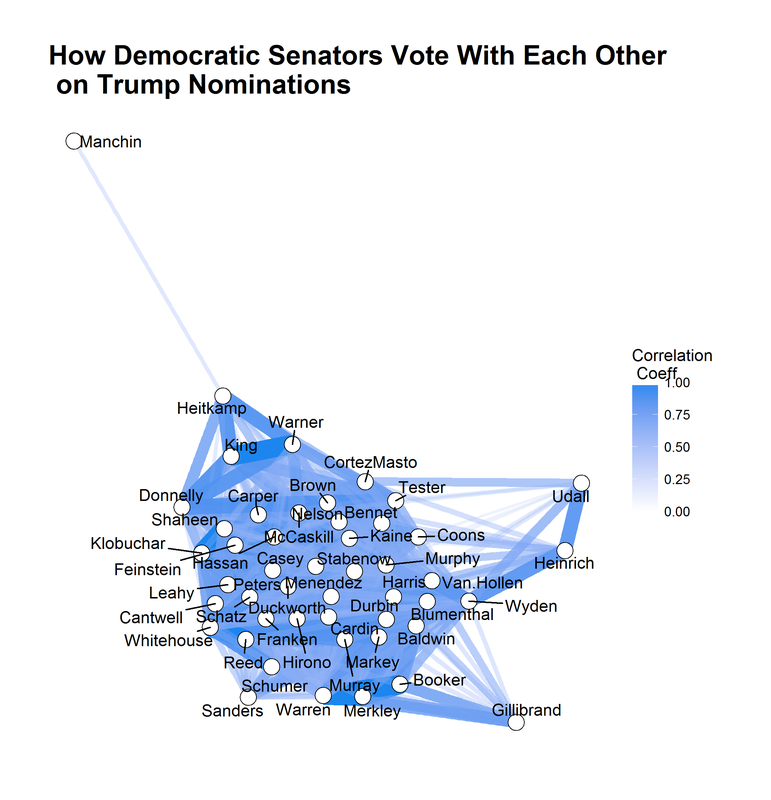 Heinrich correlates with just Ron Wyden. They are close to Cory Booker, Elizabeth Warren, and Ed Markey who all voted the same. Looking ahead to the vote to approve Neil Gorsuch to the US Supreme Court, the GOP need 8 Democratic votes to break a filibuster. If they can get the 7 members at the top of the graph above – Heitkamp (ND), Tester (MT), Donnelly (IN), King (ME), Warner (VA), McCaskill (MO), Kaine (VA) – along with Manchin are the most vulnerable to flip. Ironically, it would be Hillary Clinton’s vice presidential nominee who could decide to seat Neil Gorsuch in the chair stolen away from Merrick Garland. 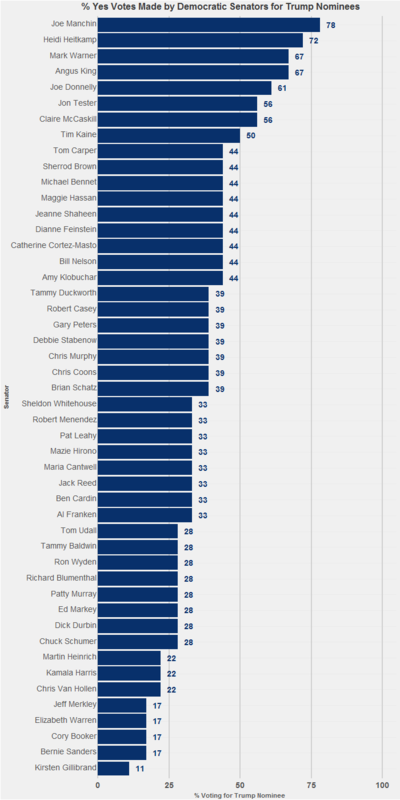 Finally, many senators voted the exact same way on each nominee. The chart above tease them out. There are nine different clusters, with the largest containing six senators. Trump’s nominees divided the Democratic caucus but they allow us to see the different groups emerging. Advocates with limited time and staff should prioritize hitting 1–2 senators in each group to maximize reach. This entry was posted in Uncategorized on March 7, 2017 by sjclermont. Only 10 recent polls in New York and the results have been pretty stable. Hillary Clinton has a small but significant lead and comes in at just over 50%. Far from over, but Bernie is going to need to shake up the dynamic in the state or hope the polls are wrong (with a heavy dose of Emerson, Siena, and Quinnipiac, this could be). This entry was posted in Uncategorized on April 12, 2016 by sjclermont. 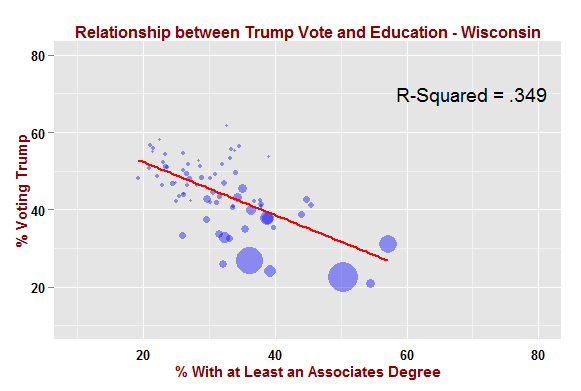 Even though he lost Wisconsin on Tuesday, Donald Trump continued doing better in counties with the lowest shares of people with college degrees and worse in the most educated part of the state. College education continues to play a significant role in Trump support, even in this much smaller field. This entry was posted in Uncategorized on April 7, 2016 by sjclermont. Donald Trump is running away with the nomination because he has performed consistently across the country. 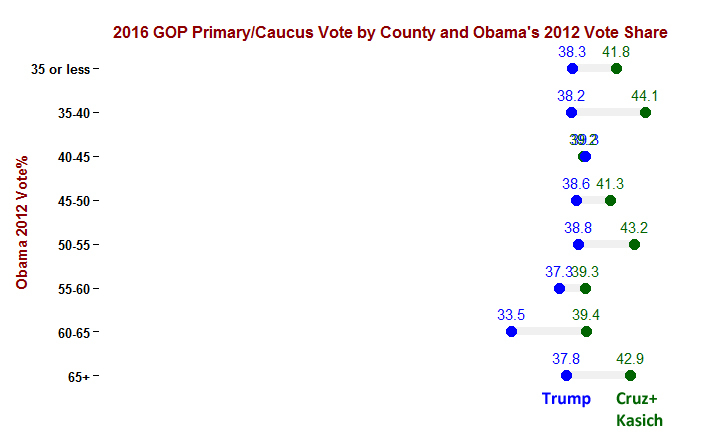 He gets roughly the same percentage of the vote in deep red counties as he does in deep blue counties. Ted Cruz and John Kasich don’t. 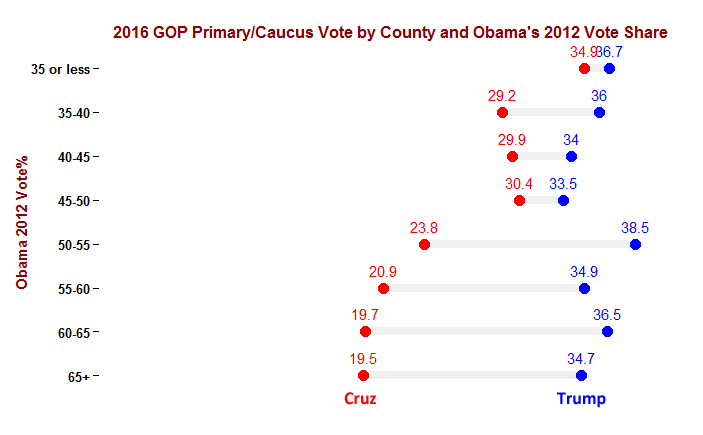 Cruz comes closest to Trump in counties where Obama got under 35% of the vote in 2012 and does much worse in counties Obama won. 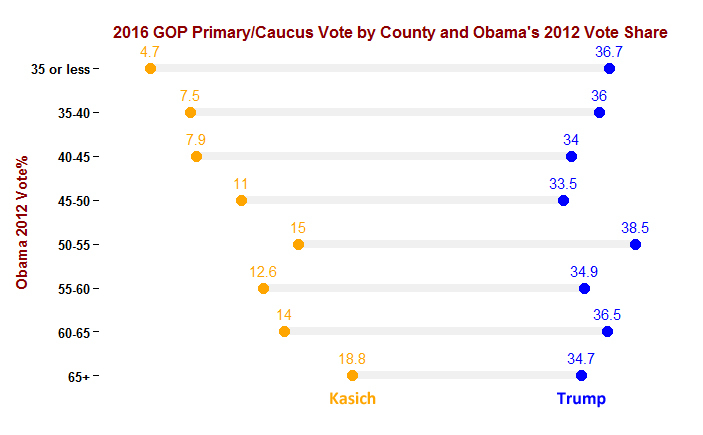 Conversely, Kasich does more than three times better in counties where Obama got 65%+ than he does in counties Obama got less than 35%. Trump beats him everywhere. Combined, Kasich and Cruz have done better than Trump both in places Obama won and lost. Unfortunately for the #NeverTrump crowd, Cruz and Kasich’s voters are so incompatible that if either one dropped, a good share their voters would support Trump. Oh well. Better settle it in Cleveland. This entry was posted in Uncategorized on March 24, 2016 by sjclermont. 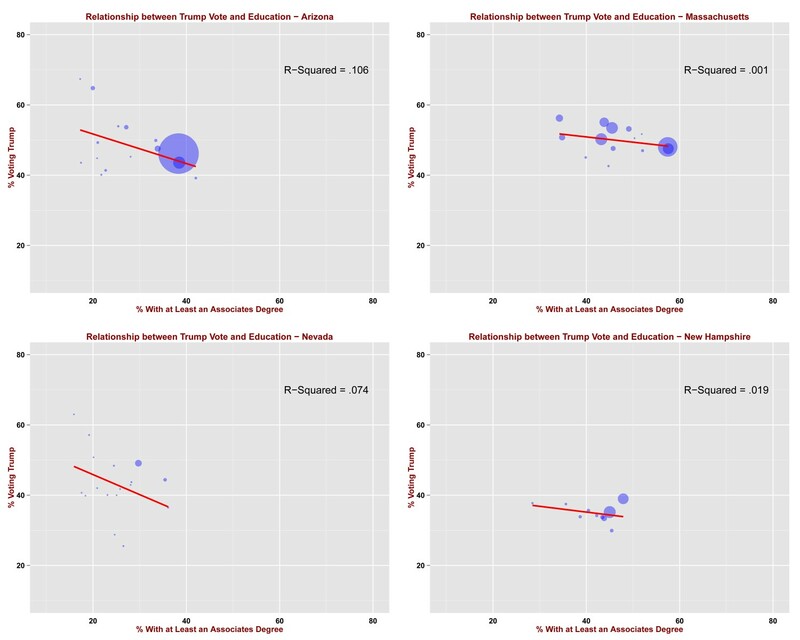 In a few states that Trump won, his performance in a county was not impacted by how educated it is. Finally, the Hillary Clinton and Bernie Sanders have significantly outraised the Republicans in campaign hard money. The Republicans have raised far less money than both successful and unsuccessful Republican campaigns in the past even though individuals can give more money to campaigns than they could in the past. One can only hope the GOP will deny their frontrunner the nomination and choose someone like Paul Ryan instead, as John Boehner would want. Nothing more in touch with your voters than denying the nomination to someone who has finished first or second in the following counties. This entry was posted in Uncategorized on March 16, 2016 by sjclermont. The Third Eye is a symbol of enlightenment in certain spiritual traditions. As the tradition goes, when the "third eye" opens, a person gains new perspective. This "new light" provides a quantum leap in perception as you discard patterns that no longer work. The third eye is symbolic of awakening and the evolution of consciousness - a key to any successful campaign and the goal of every survey conducted by Third Eye Strategies. So Is There a Blue Wave or Not? Democrats Need to Stand Up for the Coalition They Have. It’s the Majority after All.